30mg of vitamin B1, 25mg of vitamin B2, B3, and B5, 30mg of vitamin B6, 400 mcg vitamin B12. These B vitamins contribute to the normal functioning of the immune system, reduction of tiredness and fatigue and supports healthy psychological (brain) function, vision and skin. 250mcg of vitamin A in the form of beta-carotene, a form perfectly safe to take during pregnancy, which supports healthy vision and skin. 200mg of vitamin C to support the immune system. 18mg of easily absorbed iron to support mother and baby. Many women become anaemic during pregnancy and breast feeding because of the extra demands placed on the body’s resources. 1000iu of vitamin D to support healthy bones, teeth and muscle function. 90mcg of vitamin K2 which supports normal blood clotting and healthy bones. It helps to direct calcium to the bones. 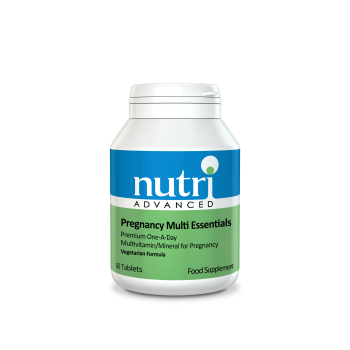 290mcg of iodine and 25mg of zinc which both support fertility and reproductive health. Support for thyroid health with 290mcg of iodine and 100mcg of selenium. 25mg of zinc which supports healthy skin, nails and bones, the immune system and contributes to cognitive function. 50mcg of chromium which contributes to the maintenance of normal blood glucose levels which controls the blood sugar level in the blood.